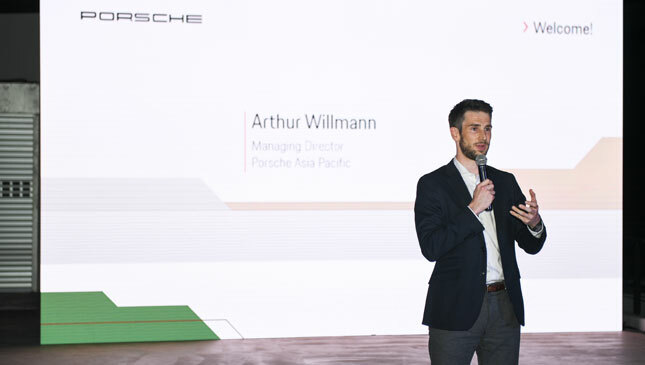 “Our aim is to showcase how the third generation of our successful SUV model line measures up as the sportiest in its class,” Arthur Willmann, Porsche Asia Pacific managing director said. The exterior emphasizes the Cayenne’s sportiness. 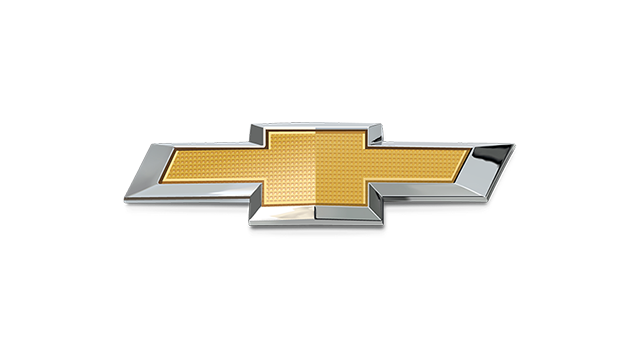 Up front, it features four-point DRLs, consistent with the rest of the Porsche model lineup. 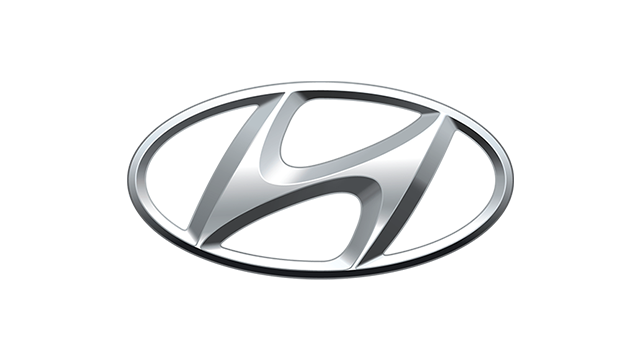 The profile evolves from the previous generations but is sleeker (in part due to a smaller rear quarter window), closely resembling the Panamera Sport Turismo. The most noticeable change is at the rear, with taillights with the integrated light strip, similar to that of the 911 4 models and the Panamera. The interior is equally sporty, drawing inspiration from the 918 Spyder, yet retaining trademark cues of the Cayenne, such as the grab handles on the center console. 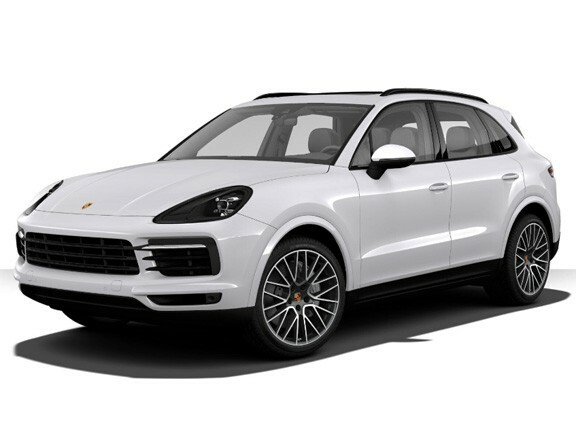 The new SUV has the Porsche Advanced Cockpit and Porsche Communication Management 12.3in touchscreen, first seen on the Panamera. 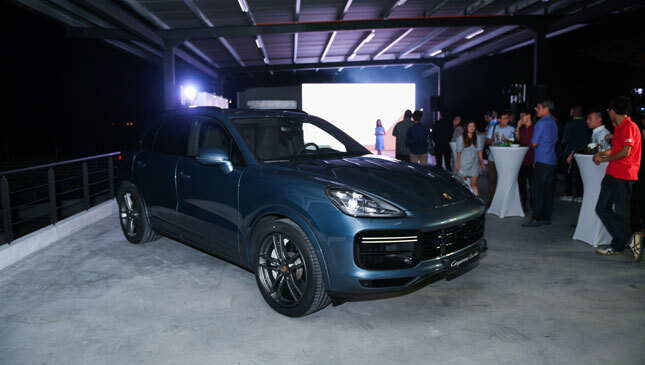 On hand at the launch are the Cayenne S with 440hp and 550Nm, and the Cayenne Turbo with 550hp and 770Nm. 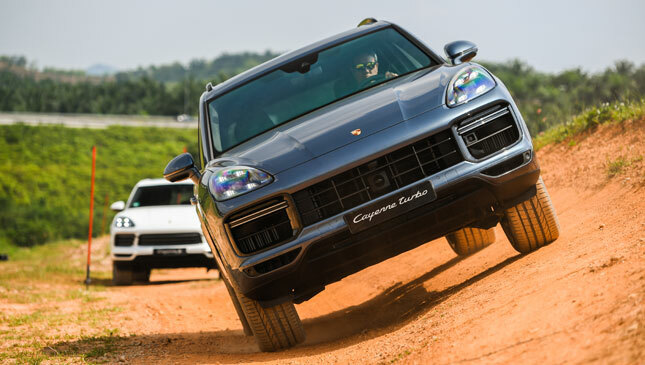 The event stresses five innovative pillars of the new model—rear-axle steering, Porsche Surface Coated Brake (PSCB), adaptive roof spoiler and air brake on the Cayenne Turbo, Sport Response button, and five programmed modes for on- and off-road—through handling, slalom, acceleration/braking, and off-road exercises. The group I belong to started the program with the off-road course. 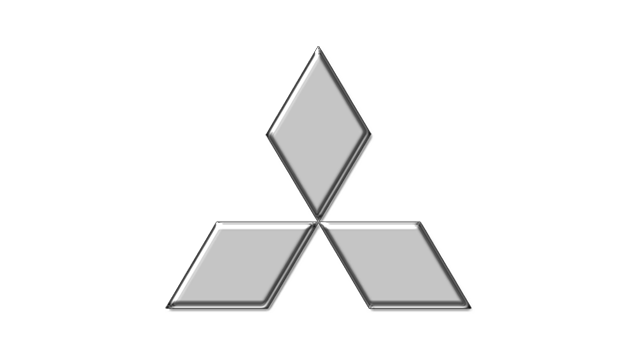 New development includes an optional three-chamber air suspension. 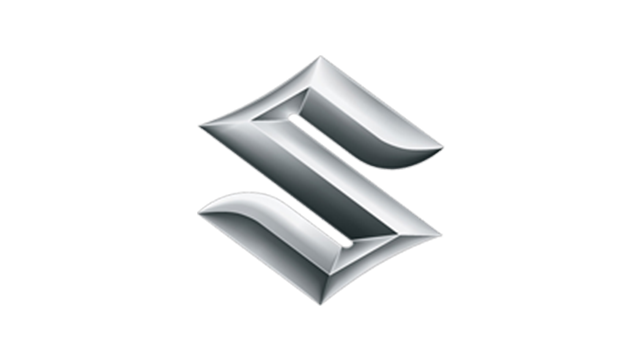 The system utilizes three air chambers for each spring strut compared to a single one before. 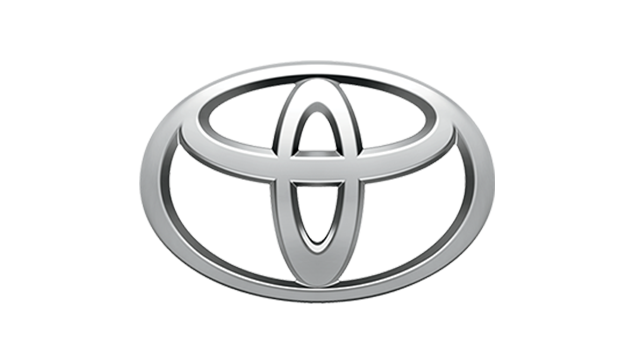 This offers a wider option of spring rates, a ground clearance of 240mm, and a fording depth of 525mm. 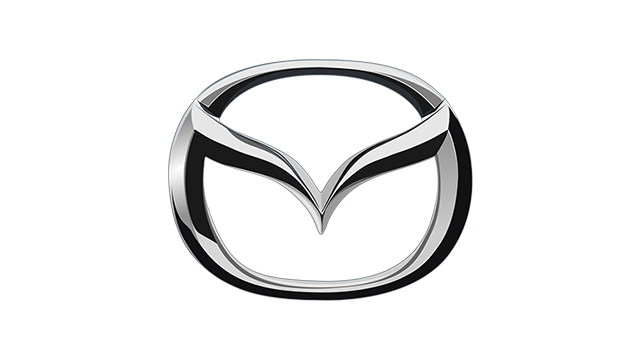 Unlike buttons on the center console in previous generations, off-road settings are now selected through a menu on the screen. 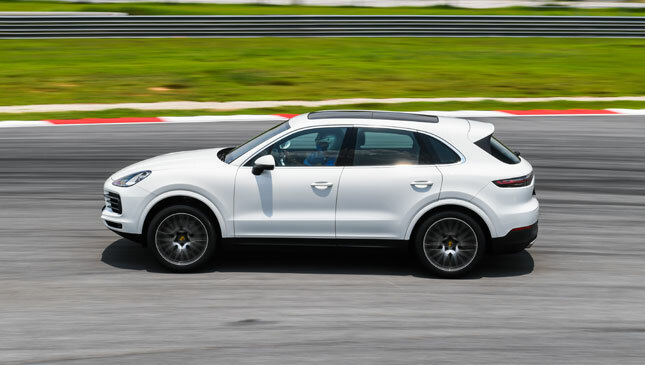 Once a mode is chosen, the system adjusts idling, transmission, the Porsche Traction Management (PTM) all-wheel system, torque distribution to the rear axle, and the Porsche Stability Management (PSM) accordingly. 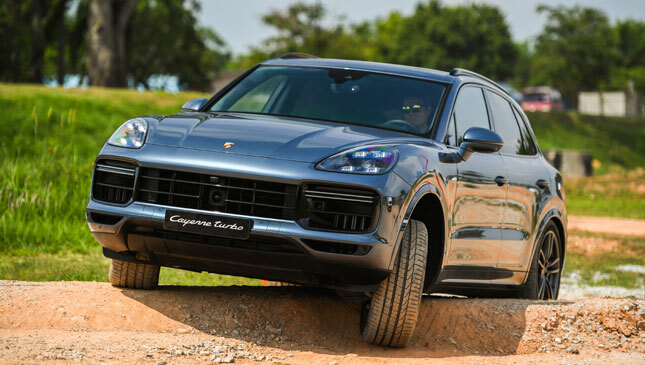 Highlights from the off-road exercise included Porsche Hill Control (PHC)—with the Cayenne descending a hill from 3 to 8kph without stepping on the brakes; an angular climb exceeding 21 degrees to one side; as well as tackling a bed of rocks. ‘Rock’ mode is chosen for the duration of the course. 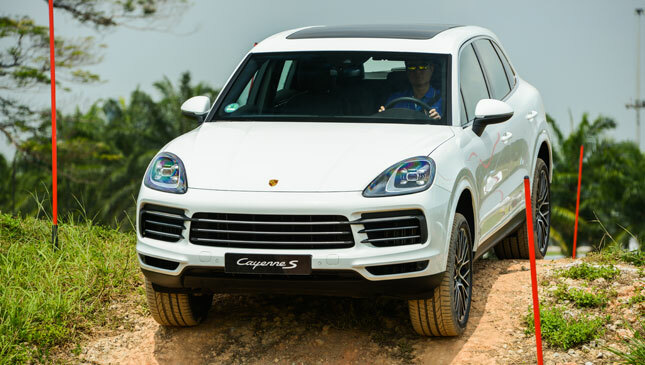 The Cayenne is not a purpose-built SUV, but it’s reassuring to know the car is capable when the need calls for it. Just be extra careful you don’t scratch those 21in rims. 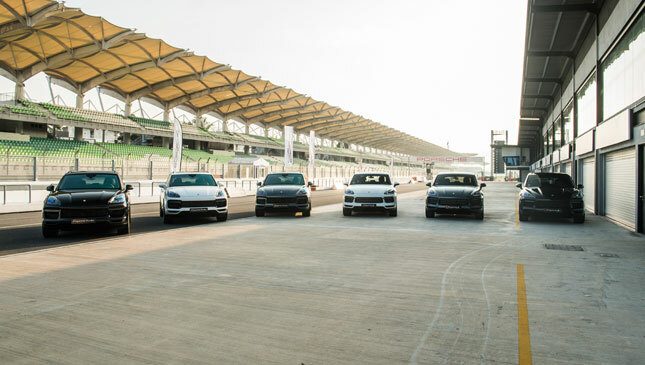 We moved on to the full track of the Sepang circuit, where the event was held, with guided hot laps with our instructor in a lead car. 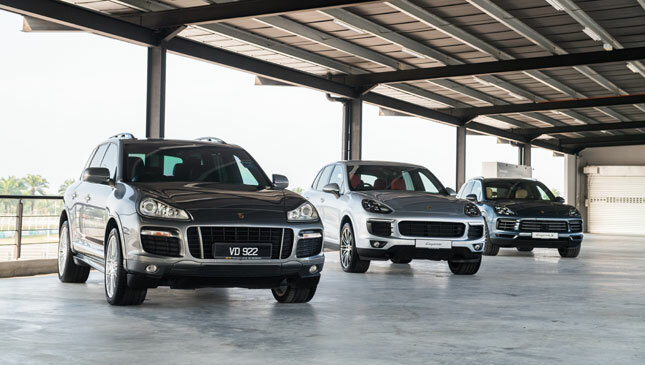 For the handling exercise, there are three Cayenne Ss—one equipped with rear-axle steering, one with Porsche Dynamic Chassis Control (PDCC), and one with neither feature—to see the differences in behavior. 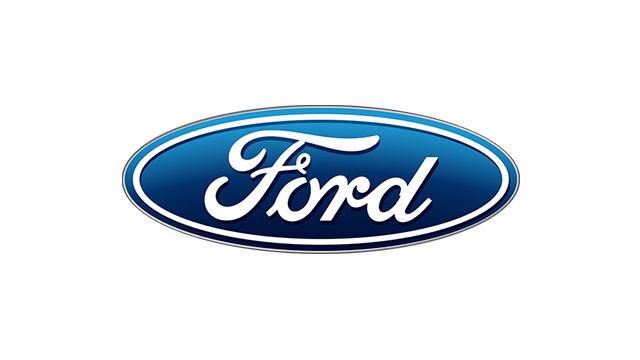 The one with rear-axle steering makes steering around the track easier and steers sooner; the car feels more agile and precise. 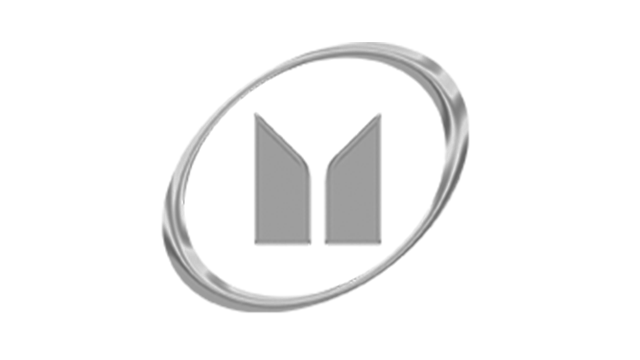 The turning circle is reduced from 12.1m to 11.5m, making driving more comfortable. The one with PDCC, meanwhile, lessens the amount of body roll, offering more stability. Lastly, the one with neither requires more steering input and has more body roll, demanding more effort from the driver. 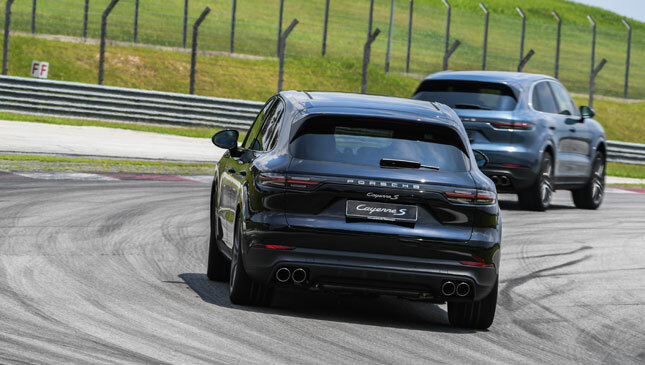 Driving around the track also gave us a chance to try out the Sport Response button, which is fitted as an option in the Cayenne for the first time. 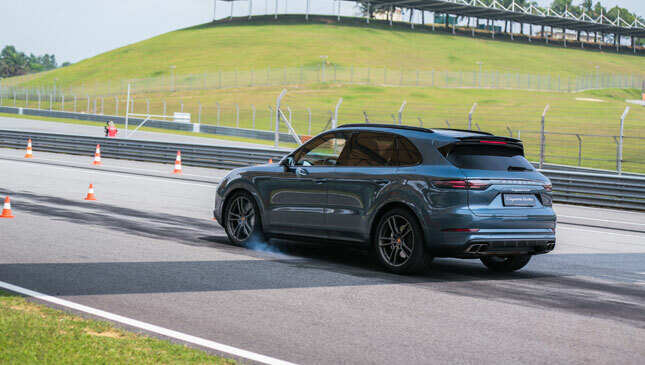 Just like in the Porsche sports cars, it gives the Cayenne extra boost for 20 seconds, though you can only use it on a long straight or a mild curve at best, similar to DRS in Formula 1. We sampled a pair of Cayenne Turbos—one without rear-axle steering and one with—on a slalom course. Throttle-steering coordination is key here, and the two Cayennes felt very different. 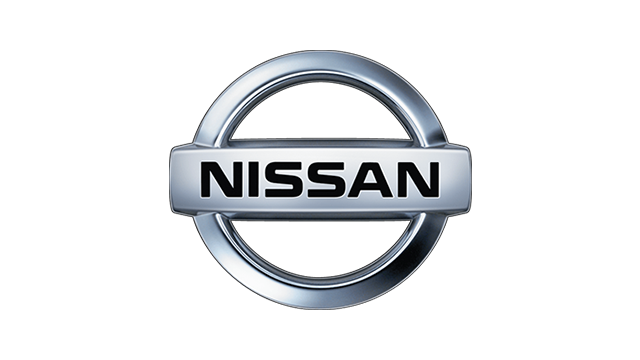 The one without rear-axle steering requires you to steer until about 180 degrees, while the one with requires you to steer just until about 110. Quite a difference. This feature makes parking and maneuvering easier, given the size of the Cayenne. We move on to the acceleration/braking test. 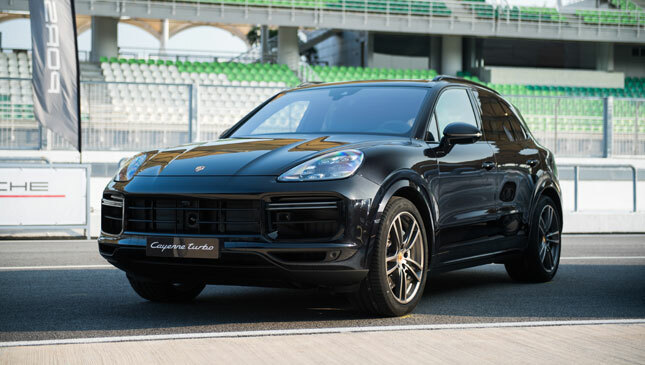 The Cayenne Turbo here is equipped with PSCB, Porsche’s new brake system which debuts on the Cayenne (standard on the Turbo and optional for the other Cayenne models). 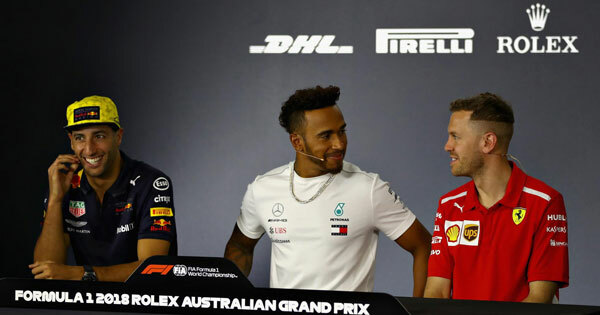 The discs are coated with tungsten-carbide, making it almost twice as durable than cast-iron brakes and three times cheaper than the Porsche Ceramic Composite Brake (PCCB). We accelerate from a standstill, and once we reach a pair of designated cones at about 55-60kph, we step on the brakes hard. The brakes have a short stopping distance and feel very grippy, comparable to PCCB. 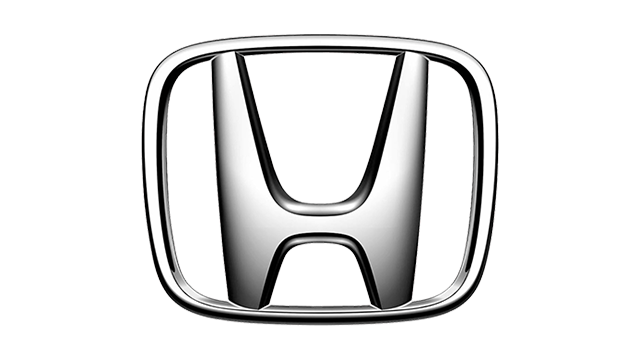 The adaptive roof spoiler tilts very slightly during this exercise. 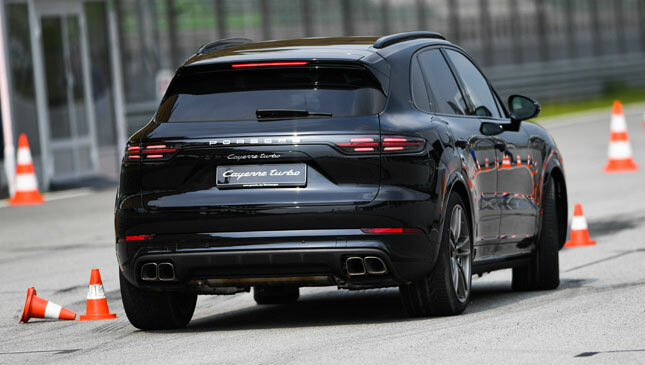 For the air brake, on the other hand, you’ll need one of Sepang’s long straights for this feature as the Cayenne Turbo needs to hit at least 170kph in order for the spoiler panel to extend. 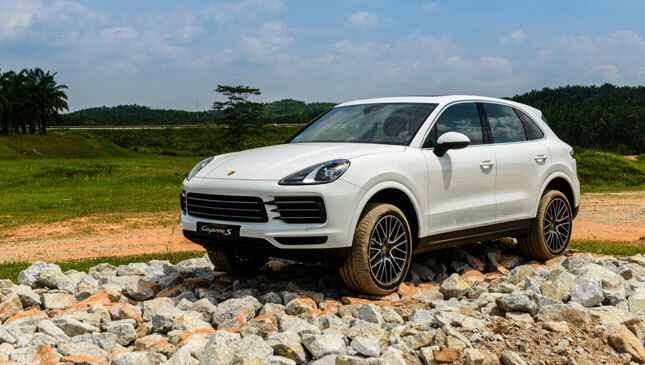 With an increase in sales from the first to the second generation, the latest Cayenne is poised for even greater success. 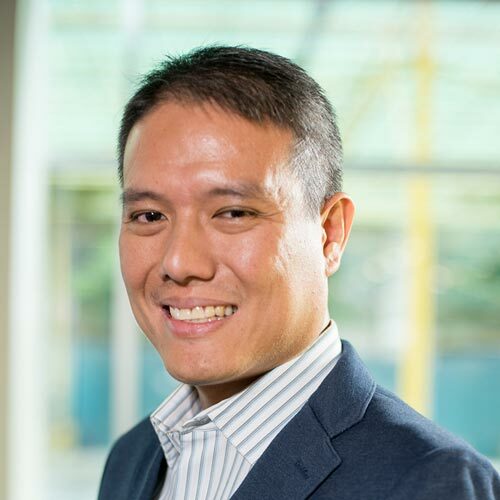 There’s no confirmed schedule yet as to when it will be available in our market, but it’s looking like the latter part of the second quarter of this year.